Oily skin is a real struggle of mine and I've had to ensure that every product within my skincare routine is suitable, and will help deal with, oily skin. 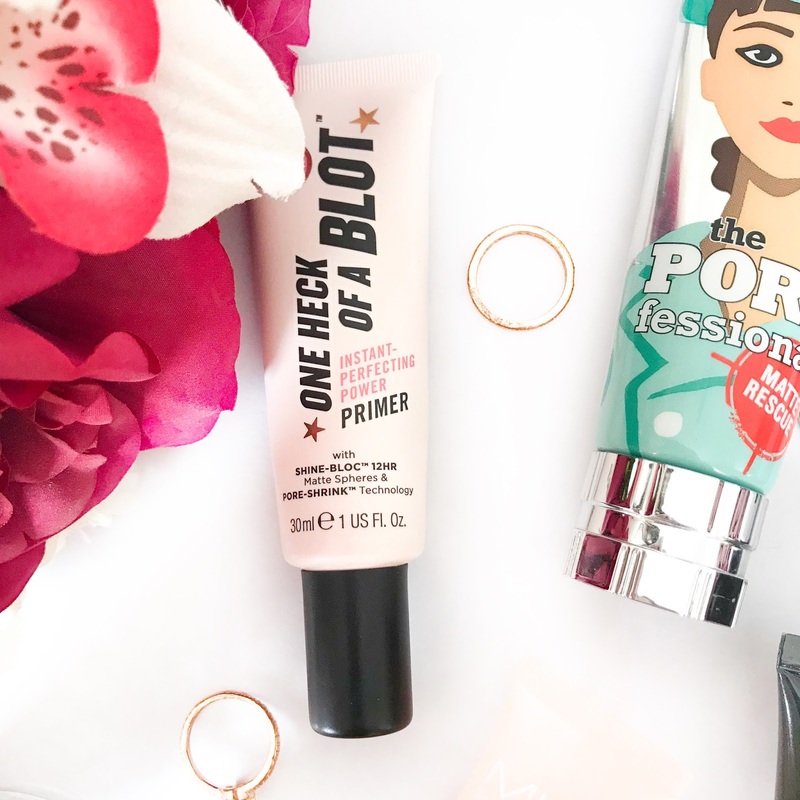 Therefore, I thought it would be a good idea to share with you some of my favourite products to help keep my oily skin at bay, starting with primers. Primer is just a product that I always include in my routine, every day, whether I'm wearing makeup or not. It's basically just an essential for me to keep my skin smooth and matte for as long as possible, and I have to admit I do love buying a nice new primer every time I see one online or in the shops. The ones I'll be sharing with you today are those which I've found to be the best to keep my skin and makeup looking fresh and oil-free. This is probably my favourite primer out of all of the primers in this post. 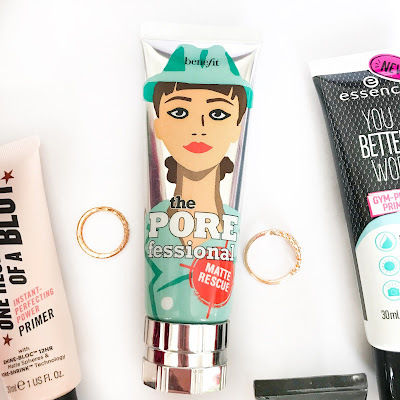 After trying the original Porefessional, I was super keen to try this one, especially as it's advertised for oily skin. In my opinion, this one is so much better than the original, which never really lived up to the hype for me. The texture is lovely and gel-like, and it feels very cooling and fresh to apply. What I really love about this primer is that it doesn't dry out my skin, which a lot of matte primers do. The refreshing gel consistency means my skin is left feeling fresh, smooth and hydrated, while also being completely shine-free at the same time. My foundation and concealer goes on beautifully over this, helped by the fact it's so smooth and doesn't give me any dry patches for foundation to cling to. Overall, if you have oily skin and are looking for a great primer that you don't mind investing in a little, I'd definitely recommend giving this one a go. 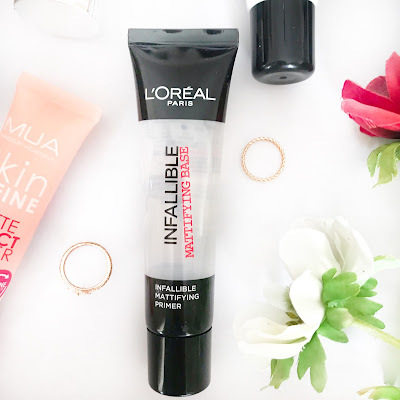 I picked this primer up because of how much I adore the Infallible Matte foundation (my fave foundation ever - check it out if you're looking for a new one!). I love how the tube is literally the same size as the foundation, meaning this will last me the longest time. As you can see from the picture, it's a clear primer and it has a silicone texture. It is very comparable to the Smashbox Photo Finish primer, but obviously a lot cheaper, so if you love that one, definitely check this one out. It goes on very smoothly and makes my skin very velvety and matte, and my makeup goes on amazingly well afterwards. It works great in conjunction with the foundation, to keep my skin matte and make my makeup last all day. I really love the consistency of this primer. It's quite creamy but also velvety and light at the same time, meaning it mattifies my skin but keeps it hydrated at the same time. The packaging is also super cute (pink - my favourite colour), so I love it even more! Again, it helps create a lovely smooth base for my makeup and keeps it in place all day. This primer is one of my faves, especially because of how cheap it is (only £3.50? Absolute bargain!). For the price, it also works amazingly well. It claims to keep your makeup on while working out at the gym, which I personally haven't tried because I don't exercise, but I'll definitely be taking this on holiday with me! The product itself is a pale green colour and the consistency is creamy, meaning it forms quite a sticky layer on your skin, which is perfect for ensuring your makeup clings to your skin and doesn't slip off throughout the day. It also has SPF20, which I think is amazing for a primer as I don't think I've ever tried one with SPF before! It definitely keeps my face shine-free in a long day, and keeps my makeup looking fresh. 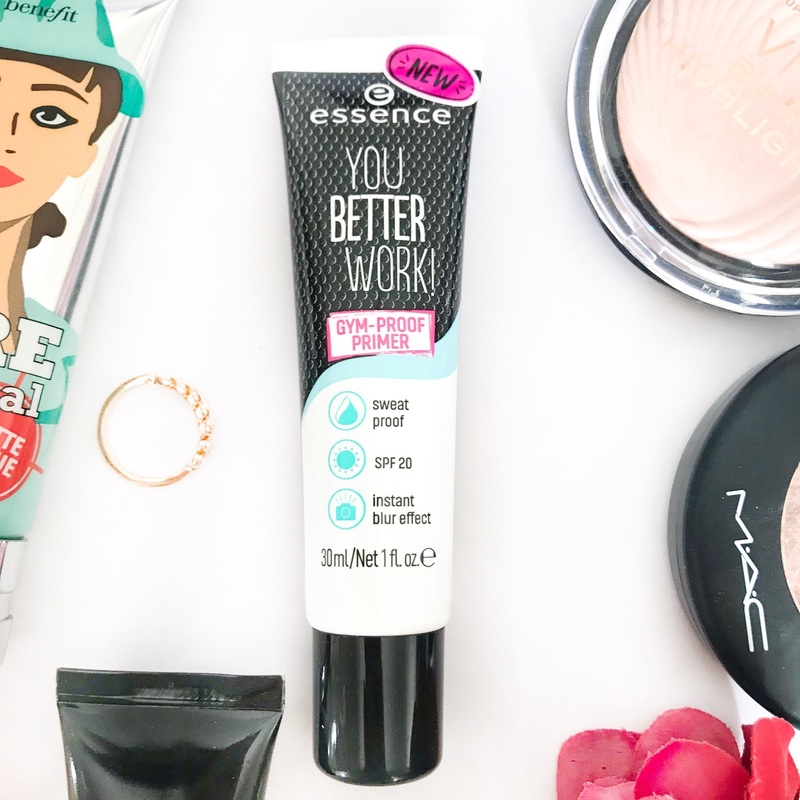 I definitely need to pick up more Essence products because they're so affordable and amazing! MUA is another very affordable brand which I've always loved. I think it's an especially perfect brand if you're just starting off with makeup, as the prices are cheap but the quality is still on point. This is another silicone-based primer, meaning it makes your skin very velvety and matte, and really helps get rid of all the shine. Something unique about this product is that it contains Vitamin E and Jojoba, which are both very beneficial for the skin. It's great that they are packed into this primer, as it ensures your face is getting cared for while being primed at the same time. Okay, those are the primers I find best for oily skin! What primer are you loving at the moment? Let me know in the comments, and thank you for reading! Disclaimer: items marked with * have been sent to me for reviewing purposes. All opinions are 100% my own. 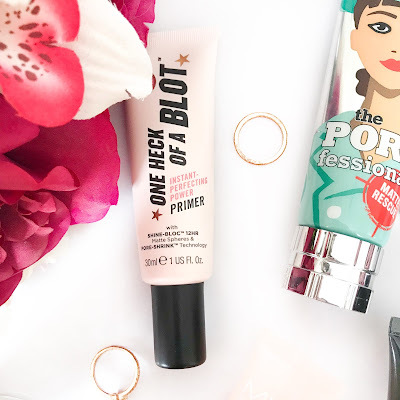 I never use primers but i totally think they're worth investing in! The “you better work primer” sounds like something I need in my collection! Haha. I love this review, never heard of these before. I need more primers in my life so I’ll check these out! I'm definitely going to invest in some of these! Primer is pretty new to me, and I have oily skin so that's always been my issue when it comes to make up! Thanks for the tips, super helpful! 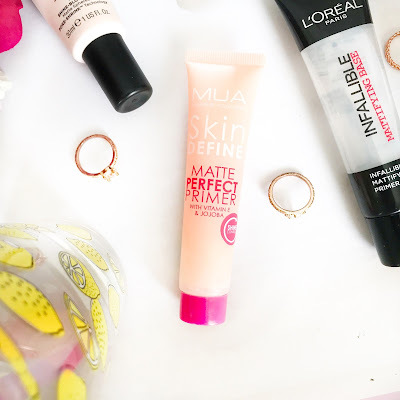 I'm still new to using primer so when my current one runs out I will definitely try the MUA matte perfect primer! Essence and MUA are such great affordable brands and they've always worked for me. I think essence is often overlooked. I'd love to see it stocked in Superdrug or Boots!